Abortion in Chile has been outlawed since 1989, when the procedure was banned in all cases — even when a woman's health or life is in jeopardy. The all-out ban makes Chile one of the most extreme anti-abortion nations in the world, leaving thousands of women each year to carry out unsafe abortions on their own. 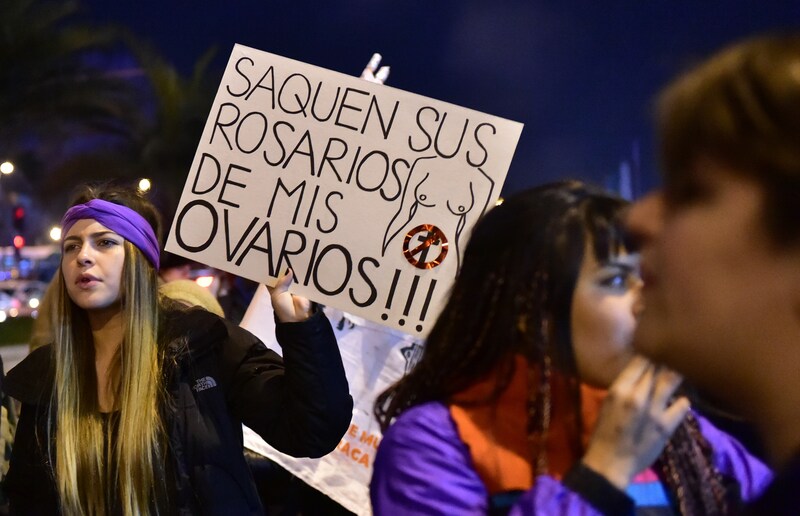 This may end soon, though only under certain circumstances: Chile President Michelle Bachelet introduced legislation to decriminalize abortion in the cases of sexual violence, fetal impairments and life-endangerment. It's not perfect, but it could signal the beginning of the end for the predominantly Catholic country's long-held criminalization on a woman's right to choose. Bachelet tabled the bill in Chile's Congress over the weekend, citing the high rate of illegal abortion as the reason to loosen the country's restrictions. "Facts have shown that the absolute criminalization of abortion has not stopped the practice," Bachelet told Congress. "This is a difficult situation and we must face it as a mature country." The proposed legislation would only allow abortions up to the 12th week of pregnancy, or up to the 18th week of pregnancy for girls 14 years of age or under, eliminating the risk of imprisonment for women who were raped or suffering from life-threatening illness. However, women who have elective abortions for other reasons could still face imprisonment for up to five years. Fortunately, Bachelet is an advocate for reproductive rights, and promised to eventually decriminalize all abortion in Chile when she assumed her position in 2014. According to BBC News, 12 bills to decriminalize abortion have been introduced in Chile's Congress since 1991. Despite being 100 percent illegal, Chile has one of the highest abortion rates in Latin America, where a total of seven countries have complete bans on abortion. It's difficult to determine an accurate number, but researchers have found that as many as 160,000 illegal abortions occur in Chile each year. According to a study published in the journal of the Chilean Society of Obstetrics and Gynecology in November 2014, about 16 percent of these abortions end up as hospital discharges. A significant number of Chile's illegal abortions are done by misoprostol, a miscarriage-inducing drug that can be taken in the privacy of a woman's home. Self-administered misoprostol abortions are notorious in the Latin American nation, with an underground hotline even in place for women who are unsure of how to use the pills or curious about the side effects and potential risks. Launched in 2009 by the Lesbians and Feminists for the Right to Information, the hotline receives an estimated 15 calls a day. With this legislation, Chile has an historic opportunity to lead the way toward more fully empowering women, protecting women’s health and safety, and fulfilling women’s fundamental human rights throughout Latin America. ... While there is much more to do to eliminate the harsh restrictions that have criminalized women’s health care in Chile for too long, this is a bold and important first step.